Wall Street dumps on cryptocurrency because… what?! A convoluted counterfeiting strategy… third parties as agents of “foreign influence”… good news for long-suffering subscribers using MSN and Hotmail… and more! As we check our screens this morning, bitcoin is at a record high of $8,317 — slightly higher than it was 24 hours earlier. In between, it fell to $7,836. 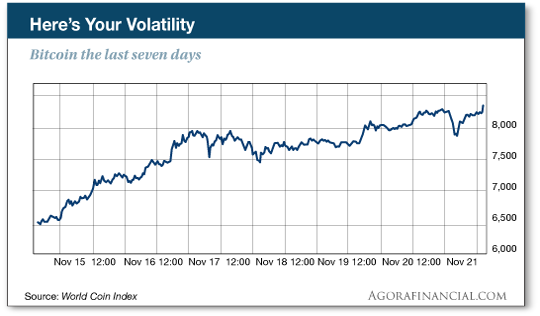 Gee, only a week ago Monday we were talking about a peak near $7,800 and a drop to $5,500. “At issue,” explains our resident crypto millionaire James Altucher, “is whether mining cryptocurrency will continue to be lucrative. “Like bitcoin, the difficulty of mining ethereum is programmed to gradually increase over time. As a result, mining of ethereum has already become significantly less profitable than it was this past summer. On the surface, this all makes sense: As colleague Emily Clancy explained here last Saturday, mining of bitcoin alone is consuming as much electricity as the nation of Nigeria — population 186 million. In theory, crypto mining reaches a point where it becomes uneconomic — even in mining hotbeds like China, where electricity is subsidized. “However, the report underestimates two critical points that will continue to produce strong demand for graphics cards,” James tells us. First, the price of ethereum could resume its rise. This morning ethereum is $371 — approaching its near-$400 highs reached earlier this year. Second, perhaps even more importantly, “graphics cards used for mining,” says James, “can be used interchangeably by miners to mine other currencies (such as zcash or monero). For the record, James first advised buying bitcoin on dips here in The 5 on Oct. 20 — when bitcoin was around $6,000. James is still accepting new registrants for the current session of his Cryptocurrency Masterclass. Enroll now and you’ll learn exactly how he made $1.8 million off a single crypto trade. James extends his personal invitation when you follow this link. For no obvious reason, the major U.S. stock indexes are flirting with all-time highs last reached two weeks ago. At last check the Dow was 14 points away from 23,600. The S&P 500 was two points away from 2,600. And the Nasdaq was up to 6,855. Curiously, bonds are rallying too — the yield on a 10-year Treasury at 2.34%. Gold took another hit after we went to virtual press yesterday, but it’s hanging tough this morning at $1,282. Crude is back above $57. The big economic number of the day surprised on the upside: Existing home sales jumped 2% in October. Both single-family homes and condos are showing strength. But it’s an economic number the mainstream usually ignores that has our attention this morning. 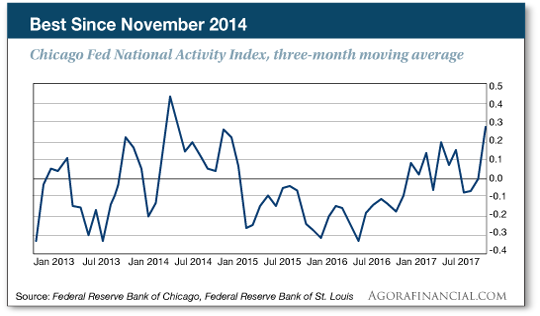 The Chicago Fed National Activity Index crunches 85 indicators for a broad picture of the economy. It has a history of foreshadowing nearly every recession going back to 1970. This morning’s number is nowhere near that recession threshold of minus 0.7; instead, it’s the strongest in nearly three years at plus 0.28. Put this number together with the leading economic indicators released yesterday… and the strong manufacturing and housing figures mentioned here on Friday… and it’s hard to escape the conclusion that we’re in the boom phase of the boom-bust cycle. For the record: Janet Yellen will not be dogging Donald Trump for the rest of his presidency. As you know, the president is replacing Yellen as Fed chair effective next February. But a question remained whether Yellen would remain in her post on the Fed’s Board of Governors — a position she could have held onto, if she chose to do so, until 2024. Yesterday she confirmed she’ll give up that post as well when Jay Powell takes over as chairman. That means by the time all the currently vacant slots are filled, six of the seven governors will be Trump appointees. The one outlier will be Obama appointee Lael Brainard. It’s an approach that works great… until it doesn’t. Jonas knows something that almost takes the luck out of the equation. Something most people don’t know. Jonas applies mathematical analysis to his proprietary trading strategy he calls Kinetic Windows. “It analyzes decades of price data to show when a stock is statistically most likely to be in motion — thus the ‘Kinetic’ part of the name. The strategy is so lucrative you won’t believe what some people will do to get their hands on it. See for yourself. So the U.S. Treasury would have us believe the Iranian government is lining its pockets by… counterfeiting the currency of the Middle East’s poorest country. Uhhh… Yemen was an economic basket case even before Saudi Arabia started bombing it and imposing a starvation blockade 2½ years ago. 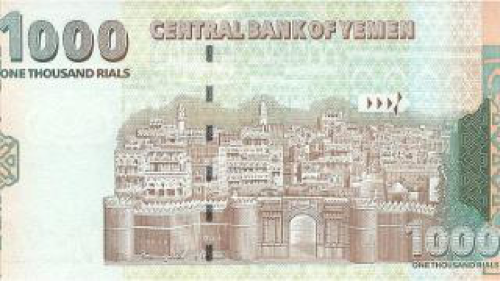 Yemen’s highest-denomination bank note, 1,000 rials, is worth less than $4. [While we’re at it: How is it that 60 Minutes did a huge story on Sunday about the humanitarian catastrophe that’s descended on Yemen — at least 10,000 dead, 2 million displaced, 1 million with cholera — and not say one word about Washington’s role in contributing to that catastrophe? “As far as I’m concerned, in the 2016 election having only 4% of those Americans who even bothered to vote voting for the Libertarian Party’s Gary Johnson is a natural disgrace. A former New Mexico governor with a long track record of fiscal sanity who would have approached getting involved in constant wars as against the national interest, against the likes of Hillary Clinton and Donald Trump, shows just how much the entire election system is rigged to benefit the Republican and Democrat parties. The 5: Heh… RT aired a third-party presidential debate between Johnson and Green Party candidate Jill Stein in 2012, which was spotlighted earlier this year in the cherry-picked U.S. intelligence “assessment” of how those dastardly Russkies are “sowing discord” in our fair land. See, you too are a “useful idiot”! The 5: At the risk of splitting hairs, did Hitler really try? On your editor’s too-long reading list is Target Switzerland by Stephen Halbrook — which tells the story of how the well-armed Swiss people disabused Hitler of the notion that an invasion would be a cakewalk. “Love the WKRP reference,” writes our final correspondent — a really underrated show. The 5: And likewise to you! P.S. Good news for MSN and Hotmail users who’ve been getting error messages when clicking on links in our emails: Problem solved. Moments ago, our web team forwarded me an email from our IT folks: It was utterly inscrutable, with geek-speak like “a dot back to 7th chunk” and “our UAT environment.” But the bottom line is that the problem should be fixed; even links within emails we sent weeks ago should be fine now. Thanks again for your patience while we figured it out.